As you probably remember, a dominating theme of the reports devoted to Computex 2005 was satellite navigation. And indeed, for the branch in the whole GPS navigation is a ring-buoy, which it is trying to catch. The main makers either have already offered their GPS solutions or are going to. And if the solution is not integrated, then it is at least a separate package with a GPS receiver. 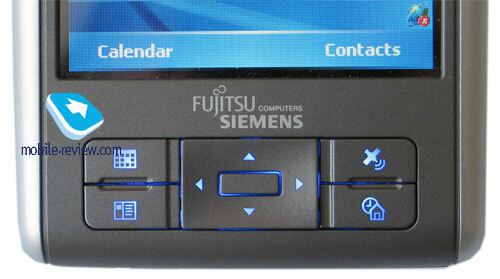 Fujitsu Siemens has been following the navigation tendency as well. Even in a July interview to the site PDAfrance the company representatives gave away three groups of new products in thes PDA segment. The first group is GPS devices. It includes both PDAs with integrated GPS receiver and only navigation oriented devices. The second group contains communicators of the T-series. And finally, the third group consists of multimedia devices. It's quite logical the whole three lines will receive different letters in front of the number of the model. And a navigation line got the letter N.
As you may remember, we received an engineer sample of FS Pocket LOOX N520 for our tests last September. Many functions did not work (the sample is very early), but still some conclusions were made. So, now we publish an updated review after we tested the commercial sample. In fact, the model is the analog of the LOOX 420 (the review is available here), innovations include integrated GPS, new operating system Windows Mobile 5.0, new CPU, USB host. On the other hand, the company deliberately simplified the handheld compared to top models by depriving it from built-in Bluetooth. 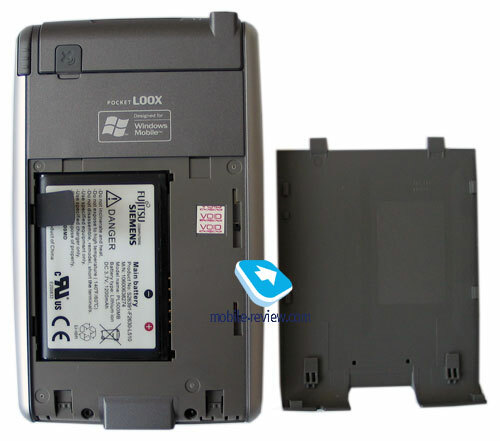 In its turn, the LOOX 420 is actually HP iPaq 4150 in another body. The company decided not to spend money on developing a new design having taken a successful design of the previous-year model almost with no changes. This design is applied in all models of the N series and new models of the C-series. The design is strict in the whole, with straight lines dominating, though a slight narrowing, which was absent before, is observed closer to the top. The quality of materials remained the same - plastic is pleasant to touch, there is a hardly noticeable backlash. Color scheme copies the elder model LOOX 720 almost completely, though the colors are imperceptibly darker. 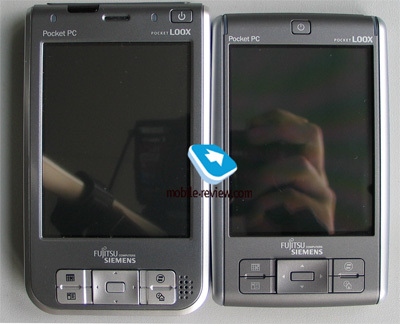 FS Pocket LOOX N520: 116x71x14 mm, 145 g (160 g. stated in official specifications – is the mistake). This is one of the first PDAs with an integrated GPS antenna and one of the smallest PDAs with integrated GPS-receiver, thus giving way only to HTC Galaxy. It is possible to carry the device wherever you like to - in a pocket of your jacket, on a belt, in a bag, a trousers pocket will also suit, and only in a shirt pocket it might be noticeable. 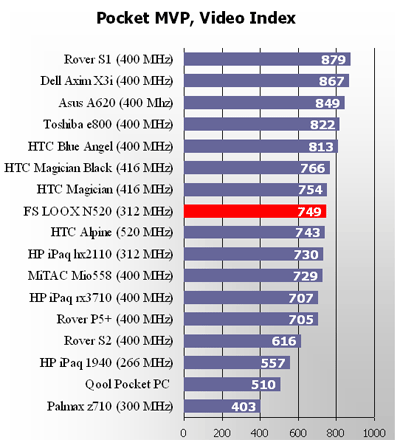 The new LOOX model exceeds all the GPS-handheld analogs and gives way only to HTC Galaxy mentioned above. Let's talk about changes in the appearance, in fact, they are mostly cosmetic and do not affect the perception of the model. Two LED indicators are placed on both sides of the top part, the buttons and their ergonomics have not changed, only the color got dark. In general, the model can be called suitable for playing games. Despite of unusual form, the buttons and the joystick have average keystroke and exact feedback when pressed. Both of them have pleasant blue backlight. The loudspeaker integrated into the joystick “yells” at the maximum volume (hard to pick up another word). The commercial version has a quieter speaker, but it’s no longer creaking. The integrated microphone has migrated to the left side from the top front part, moving slightly the voice recorder button. The IrDA port is placed on the same side. To use VoIP telephony, Skype, for instance, you'll have to rotate the LOOX upside down. You'll find it comfortable to flick through e-books with the voice recorder button. The quality of the voice recorder files is higher than of the LOOX 420, reaches the level of the LOOX 720, which is beyond praise. There are plenty of voice recorder settings, the words recorded within a 3-4 meters distance from the PDA will be heard well. There are no control elements on the right side. On the top end, you'll find a stylus, an SD/MMC slot, a standard headphones jack - and nothing surprising. 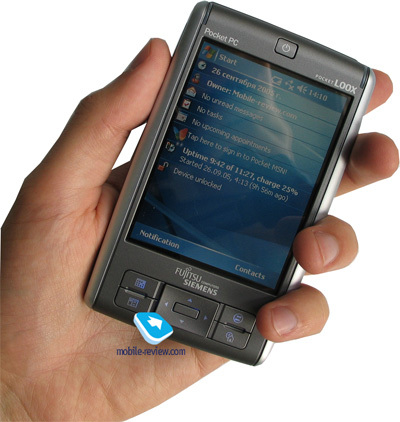 The music playback quality is good, this PDA can be used as a music player. Unusual thing is that you can control audio playback. For example, you can switch off the external speaker and hear the sound in the headphones only, or you can enable simultaneous playback via the external speaker and in the headphones. The battery cover takes the most part of the back. The top part has a special connector for an external GPS antenna, and a satellite icon is depicted on the rubber antenna gag. The soft reset button and the universal connector for USB-sync cable are at the bottom. The connector is similar to those integrated into FS LOOX 420, FS LOOX 720, Asus A716, Asus A620, and Pocket LOOX 610. One of the most important innovations in the model is the USB-host, which allows connecting external USB devices. With the new LOOX model we have successfully tested a tiny keyboard CHERRY Mini Keyboard, SD-USB card and other USB drives. However, USB mice failed working. Fujitsu Siemens highlights this opportunity, the sales package lacks the cable, so you’ll have to buy it. At the moment 3 products are announced in the N-series. One of the differences in the series is the set of wireless modules. The N500 lacks both Wi-Fi and Bluetooth, the N520 has Wi-Fi only, and the senior model N560 with the VGA LCD is equipped with both modules. 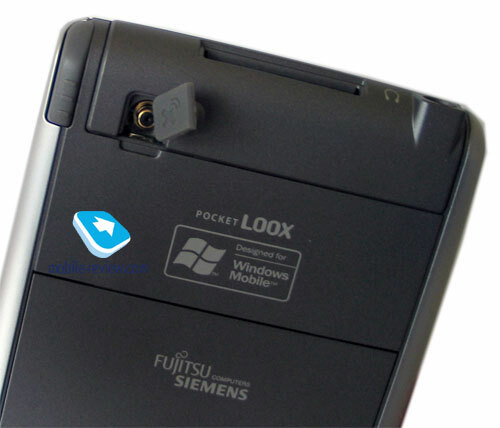 FS Pocket LOOX N520 has an integrated Wi-Fi (IEEE802.11g) module, this is the main and almost the only distinction from the LOOX N500 modification. 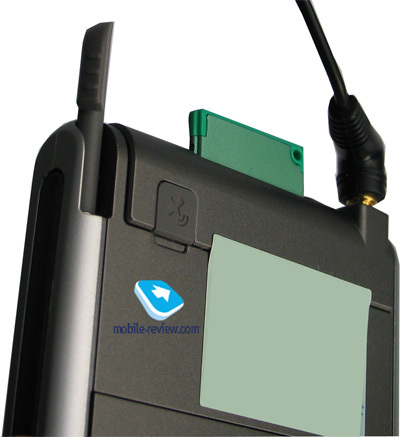 The handheld easily finds any wireless networks and gets connected successfully. There is the support of WEP and WPA protection. The N520 has power saving mode, which lowers receiver sensitivity and spares battery charge. In the office building the signal from the hot spot got through several bearing-walls within a 50 meters distance. 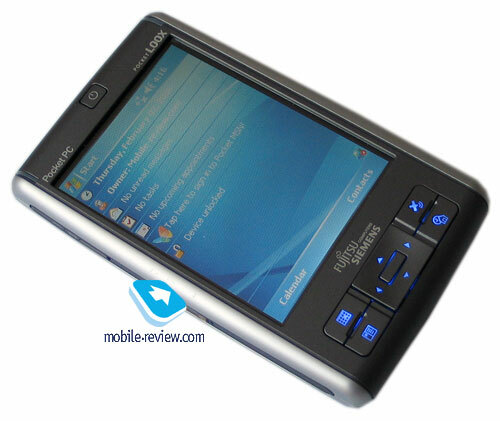 The navigation chip SiRF Star III has virtually become the standard for PDA, it is used by most of manufacturers. That’s why test results of different models are similar. In our case, the LOOX N520 hasn’t shown anything extraordinary. 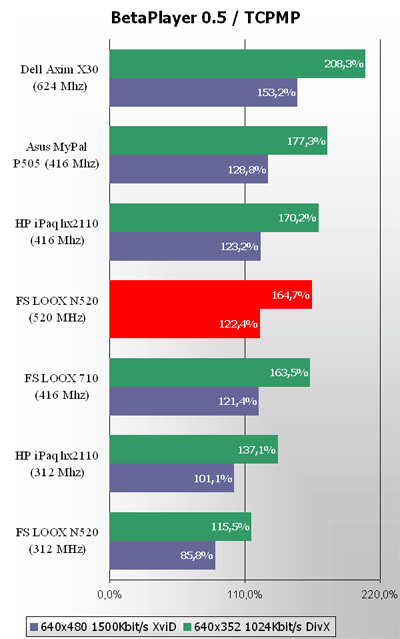 The results turned to be close to Asus MyPAL A636 with the closed antenna, and higher in stability against HTC Galaxy. 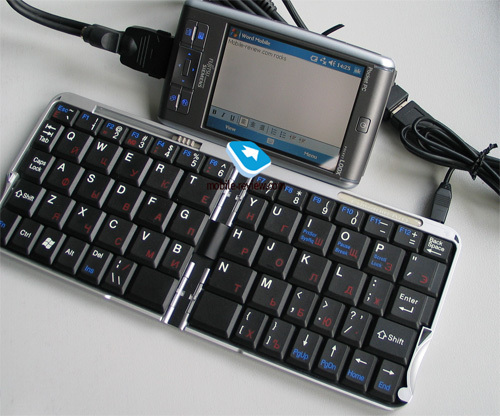 The screen is absolutely typical of a middle and low-end Pocket PC device: that is TFT with a 320x240 pixel resolution, 65K colors and a 3.5" diagonal. This screen behaves well both indoors and outdoors, which is typical for all transflective screens. There are 10 backlight levels, and the minimal level is not enough for comfortable work in the dark. The screen doesn't get yellow when viewing angles. Comfortable viewing angles from all sides make up 45 degrees. The removable Li-Ion battery increased from 1130 mAh to 1200 mAh. Like in the rest here we see gradual improvement of technical specs. The battery life was to be increased even more due to the new operating system and cancelled "72 hours rule", the rule implies some charge is reserved not to lose data in the course of 72 hours after strong discharge. So, let’s see battery life results, they seem to be quite good. The battery plastic cover slightly bends when pressed with a finger. I'd remind you that memory is organized differently in Windows Mobile 5.0. 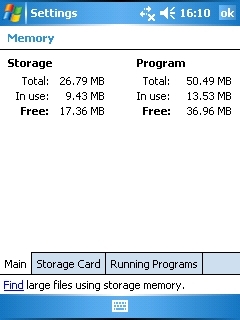 Volatile RAM is used only as RAM, user’s data is longer stored in it. 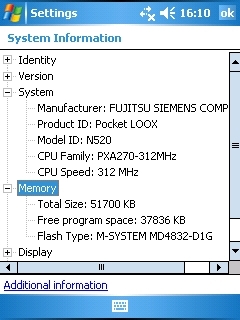 Flash-memory available for storing user’s data and programs makes up 83.9 MB, and available RAM – 50.49 MB. 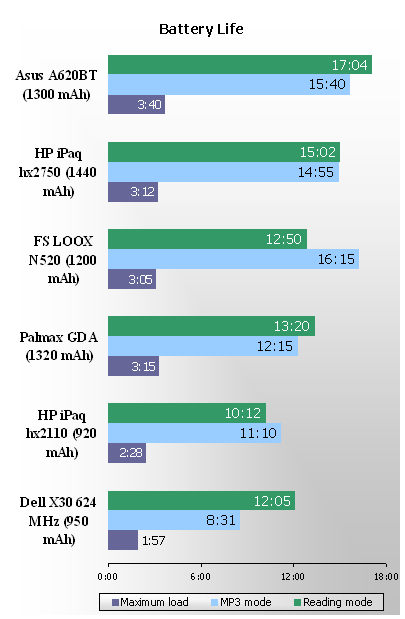 The new LOOX is powered by Intel PXA270 processor working on the maximum clock rate of 312 MHz. Let's see what it is capable of. 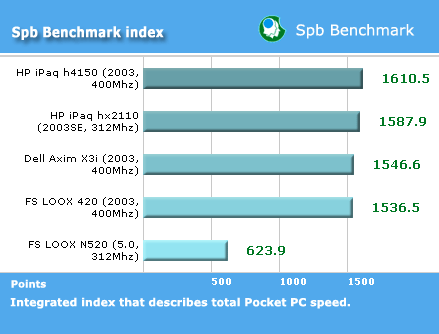 We start from our standard test using SPB Benchmark, for comparison we'll take PDAs with similar functionality. 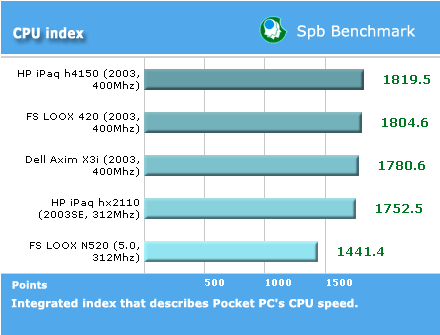 The integrated index describes the CPU speed. The model remains behind the others, though uncritically. The file system test fails due to the memory reorganization. There is no such lag in reality. The test is inadequate. 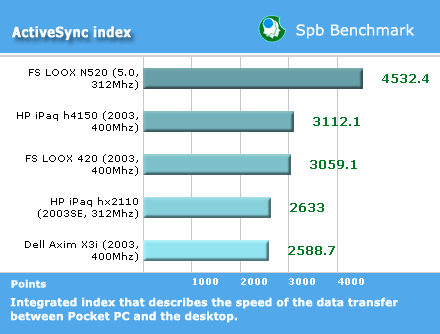 Due to an improved ActiveSync version, the model shows record speed of synchronization. The total index seemed to represent the real picture of the PDA productivity. If that is so, the N520 results are failure. But is it right? The answer is negative. 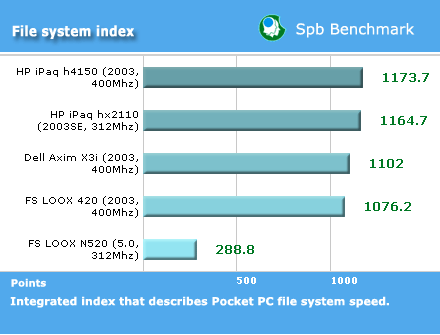 In fact, SPB Benchmark is unsuitable to compare Pocket PC with different versions of operating system. The distortion in the total index is caused by different memory organization in the new version of Windows Mobile. Here we will provide the test results in real applications; they are much closer to the reality. The PDA showed the best results at video playback. In our case, we launched 4 clips at different stream intensity without Wireless MMX optimization (the function of PXA270 processor), the index was formed on the basis of dropped frames. The less dropped frames, the higher the index is. 1000 index means no dropped frames at all. 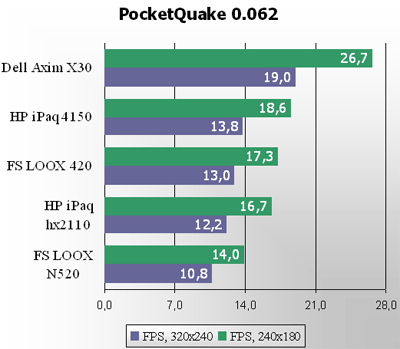 We see the Pocket LOOX N520 outpacing all the models with 312 MHz processor. Given this clock rate (312 MHz) the clips ran surprisingly smoothly. To test graphics productivity we ran tests of the PocketQuake game in the mute mode (turn the sound off by nosound 1 console command, leaving other settings unchanged). There is an averaged figure by 2 tests (Demo 1 and Demo2). The test revealed good results. 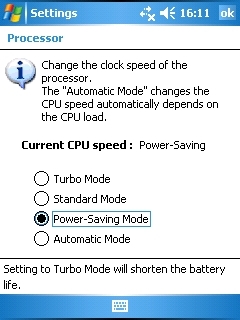 If, for some reason, you find the initial clock rate slow, you can speed up the PDA (the only thing that can happen is hard reset followed by data loss). We sped up the processor with XCPUScalar utility, and productivity growth was measured with BetaPlayer, the Wireless MMX optimization was on. The PDA worked steady only on the clock rate less than 520 MHz, and further speed up made the device freeze and work unsteady. As we see, the results are not bad, though not the best. The PDA has enough productivity (with the speed up) to cope with any tasks. That’s the short resume on the productivity of the model. 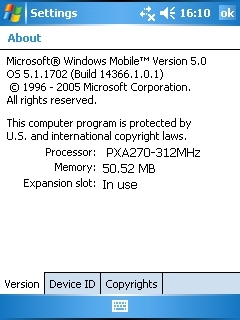 The PDA is powered by the fifth version of Windows Mobile. Details about all the standard programs are available in a special review on our site (though, you should realize there are no specific phone applications in the LOOX N520), and here we tell about non-standard programs in short. The set of extra programs is still poor. There are no programs for data backup, though actually there is no need in it taking into account the new memory organization. FSC VoiceRecorder. 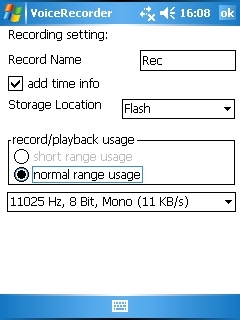 The voice recorder supports WAV format. It differs from the integrated voice recorder in fine settings and a capability to write info on a storage card. FSC Panning. Holding a corresponding hardware button the program is assigned to, you can move along the page in Pocket IE using a stylus pen, it like drags the working area. In Europe the model is supplied with the navigation program Navigon version 5. With the new N-series Fujitsu Siemens makes a move in the right direction, the satellite navigation. Now we see the growing competition among GSP solutions. And if earlier there was only the Taiwanese company MiTAC on the market with its only product (MiTAC Mio168), then now almost all the companies either offer or plan to introduce own GPS solutions (we expect a GPS-PDA by HP). FS Pocket LOOX N520 is now one of the most attractive GPS PDAs on the market, though it loses to HTC Galaxy in attraction, however there is a better implemented GPS in the N520, it is more stable. 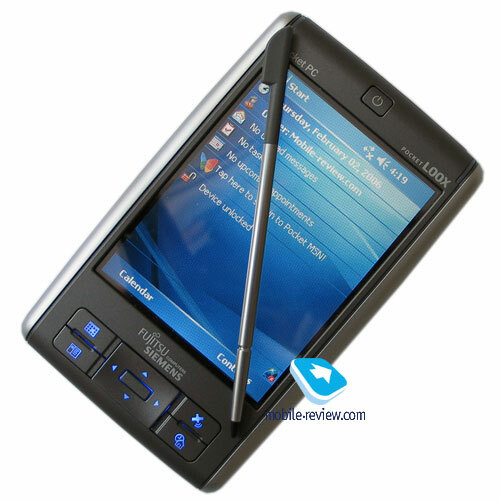 In its time the LOOX 420 really was a developed version of HP iPaq 4150 with a better screen and battery. The one maker produced both devices - HTC. FS Pocket LOOX N520 with the forerunner’s design can be called “the third edition, improved and supplemented”: a GPS receiver (the main innovation), USB host, improved voice recorder, a bit better battery and processor, new OS, but no Bluetooth. It seems so from side. In fact, a well-known model LOOX 710 was taken as the base (this very model is mentioned in the register of the early sample), and many things get clear at once - USB host, voice recorder, and new CPU. The developers replaced a CF slot with the GPS module (no need to change the card for the new module), less in size it allowed reducing the whole size of the device, and less in weight (due to a less capacious battery). And now, I think it won't be hard for you to guess what the N560 model with a VGA screen is, and which model it is based on. You should have a closer look at the model if you need the maximum functional PDA with an attractive design (remember the CPU is easy to speed up to 520 MHz), and do not care about the screen, the second card slot and Bluetooth. The lowest price in Moscow for FS Pocket LOOX N520 makes up some $390-400. The junior model N500 costs $340-350. You’d better choose the latter, if you don’t need Wi-Fi.